In 2013, Cheikh Diaw, an environmental expert who has been trained in forest and environmental management in Sweden and Cameroon and who has founded the organization SAPOP (Structure d’Appui aux Organisations Paysannes & Professionnelles de Fimela), contacted us. SAPOP is a Senegalese organization committed to as well preserving the rest of the forest stand as reafforesting in the Fatick region. SAPOP aims to provide the rural population in the approximately 40 villages with a resource-friendly, sustainable management of arable and livestock farming. We were asked by SAPOP to introduce solar cooking in the region. On our behalf, Alioune Diallo from EG-Solar visited the headquarters of SAPOP in Fimela and informed us about the progress of the activities. He handed over two solar cookers as first gesture of cooperation. 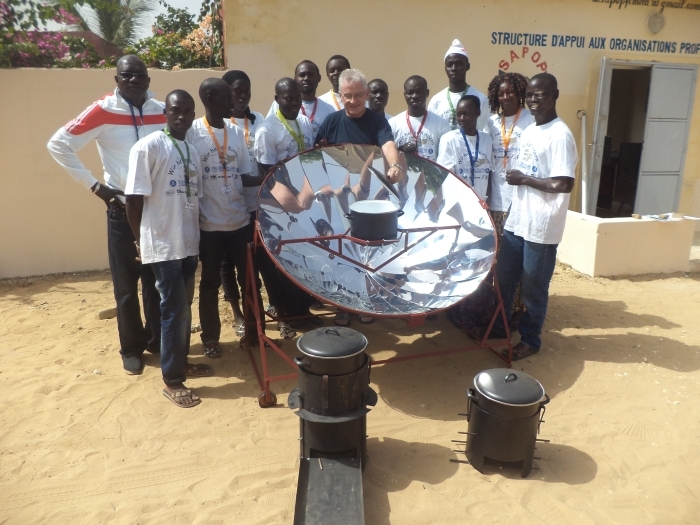 Women from Samba Dia, experienced in solar cooking, demonstrated the cooking performance of the SK14 with solar cooked Senegalese dishes. Thereafter SAPOP started a promotion tour with the two solar cookers through all the villages around. Since the interest of the women in our solar cookers was very great, we decided to have another 10 cookers built by ECOPROTECT and sent to SAPOP. In March 2015, a devastating cyclone raged in the South Pacific Ocean, leaving a verge of devastation on the island group of Vanuatu. In cooperation with the local service center of the GIZ (German Society for International Cooperation) and the local environmental organization “The Nguna-Pele Marine and Land Protected Area Network” (NGO), EG Solar wanted to contribute its possible help to the needy and called on for a donation campaign for solar cookers. At the end of September, 30 solar cookers Premium14 went on a voyage and were received in december, thanks to customs clearance from our partner organization. The users of the solar cookers are enthusiastic about their performance and the wide range of possible applications. A milestone in the distribution of solar cookers was set in 2006. 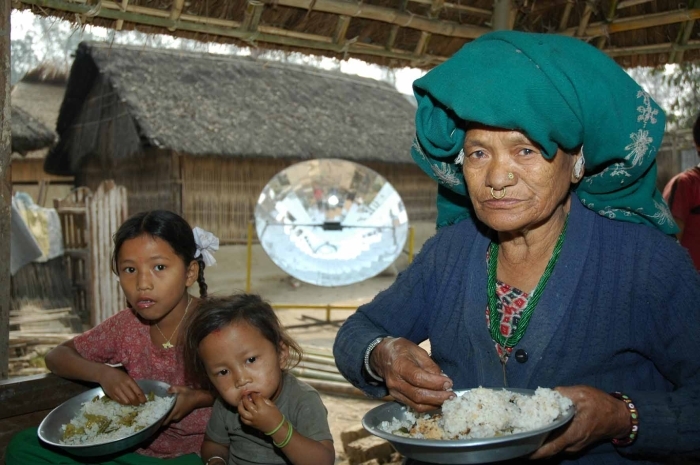 For 7 Bhutanese refugee camps, a solar cooking program was launched in Nepal by the Vajra Foundation Nepal in cooperation with the UNHCR (Office of the United Nations High Commissioner for Refugees) and Dutch refugee relief. The program included the construction of 6,300 solar cookers and 12,000 hot-water containers, as well as training and instruction in solar cooking. EG-Solar e.V. would also like to provide “aid to self-help” in other refugee camps. What is missing are partners in the many camps and financial resources. For the construction, implementation and support of the 7000 solar cookers in Nepal, approximately 1.5 million EUR were spent.